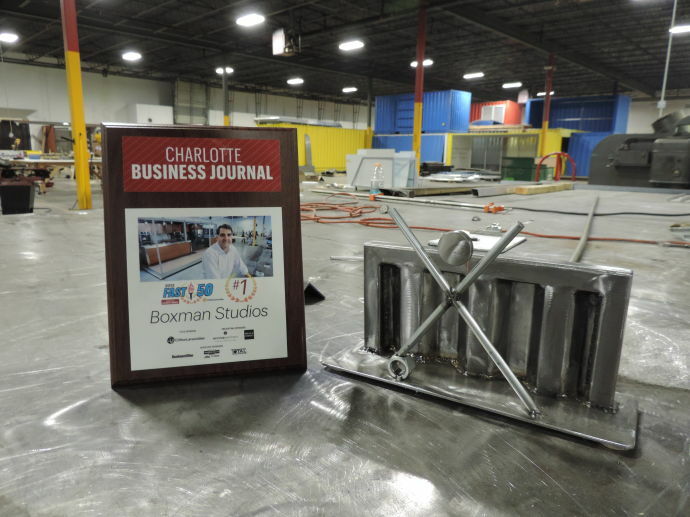 All of us at Boxman Studios are honored and proud to be the winners of the 2013 Charlotte Business Journal’s Fast 50 Award which is awarded to the fastest growing company in the Charlotte region. We were able to bring home the gold with 510% growth over the past three years which was almost 300% higher than our next closest competitor. Last year around this time we posted a Thank You letter for a wonderful year. At the time we had just finished up projects with Office Depot, Infiniti, and our Google DNC build which used the highest number of containers to date. Also in 2012 we moved to a new facility, added new employees, and took on a lot of new business. In 2013 we have grown from 20 to almost 50 employees, moved into another facility (with 60,000 square feet of manufacturing space) and just completed some of our most advanced and complex projects ever with Hyundai, Electrolux, and IMG College. In 2009 we started this company with a handful of people and a radical idea. Since then we have evolved into the global leaders for shipping container modification, design, and logistics. Our facilities are filled with knowledgeable and forward-thinking fabricators, logisticians, project managers, woodworkers, metalworkers, designers, and more. We’re very proud of our family, and we’re excited to continue to add new faces, and take on new projects. And we want to thank you for your support over the years, and sharing what we do. We’re lucky to be a part of such a supportive community, and could not of achieved what we have without it. Congratulations to all the companies that took part in this year’s Charlotte Business Journal Fast 50 Competition. We look forward to seeing you again next year.